All gun owners know the importance of keeping their firearms safe and out of harms way. The Barska Quick Access Biometric Rifle Safe is an easy-to-use system that brings security to your home. This all-steel safe will give you peace of mind and a place to securely store away all rifles and firearms. With the advanced biometric fingerprint identification system, opening a safe has never been quicker or easier. Be confident that your firearms are protected away from unauthorized hands. Barska Quick Access Biometric Rifle Safe uses advanced biometric fingerprint technology to protect against any unauthorized access. This means that only selected users can access the contents of the safe and only those fingerprints contained in its database. In the case of an emergency, Barska provides 2 back-up keys for instant access. This solid-steel construction is secured by a 3 point dead bolt. Which is made of 1″ steel locks, ensuring your firearms are stored securely. The safe comes complete with mounting hardware and pre-drilled anchor points. Allowing you to attach the safe to the wall or floor. Triple protecting your firearms away from any unwanted intruders. With the Quick Access Biometric Rifle Safe using advanced biometric fingerprint technology, users can ensure quick and easy access to their firearms. Whether it’s an emergency or just the being able to get your guns at a moments notice. The fingerprint database stores up to 120 identities so that you can program in every possible situation. There is also a programmable silent access mode. Which enables you to mute the access notification. This allows you to open the safe silently and discretely. Perfect for a home invasion scenario. Or even when you just want to get at yours guns to go hunting and don’t want to wake up your wife. The Quick Access Biometric Rifle Safe has enough room for you to store up to 4 long rifles in an adjustable rifle rack. There is also an upper shelf that can be used for ammunition, important documents or even additional handguns. The Barska Quick Access Biometric Rifle Safe has received some minor complaints from customers. Some of them believe that the safe should be bigger. However; for a quick access safe it is meant to be small and fast. If you are looking for a bigger Barska safe, feel free to read our other reviews here. Please be advised to keep the fingerprint scanner clean. There can consistency issues if you do not properly clean it. The last issue, albeit minor – the safe is small. It can be moved easily. Due to it’s slender build it can also tip, if you are not careful. Make sure it is in a secure spot. We highly recommend that you bolt it down. Barska gun safes offers the best of modern security to keep your firearms safe. While making it easy and hassle-free to get at your guns in a emergency. 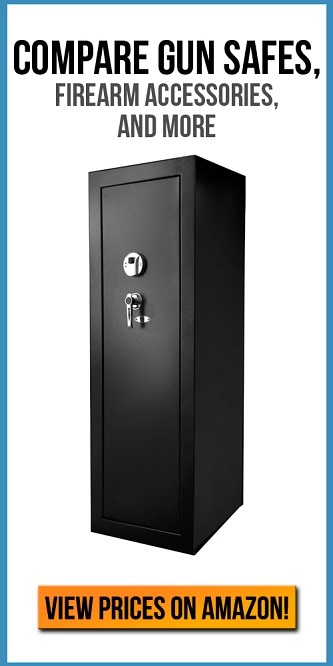 With an all-steel construction, it is a durable and reliable safe that is prepared for any situation. The Barska Quick Access Biometric Rifle Safe is a sure fire choice when shopping around for gun safes. Pay the good money, and you will receive the good safes. This product is no different.